I cant't believe December is already here. Seriously, this has been the fastest year of my life. It literally seems like I just planned my new year resolutions and now I only had merely 30 days to achieve all that. Checked, checked, checked! My main goals this month is to work on our lil family trip for next year. I was so sorry for not having more time for my family for the past couple of weeks. I had so much works to do at the office preparing business proposal for upcoming projects and proposed schedule for next year. I skipped dinner with my family and by the time I'm home, my daughter has asleep. Sigh! Last weekend we went up north to Perlis visiting the hub's Tok Wan. Tok Wan was sick. He admitted at Kangar General Hospital more than a week ago due to shortness of breath. We drove more than six hours from KL before we reach Kangar. My parents was following us visiting Tok Wan. Yesterday when hubby called up my FIL, Tok Wan was already transferred to normal ward and hopefully he can be discharge from hospital very soon. December is gonna be a busy month for me. And I don't really like the weather now. 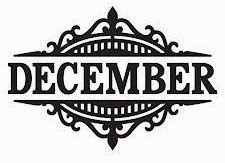 Oh December, please be nice to me. Ow ya, I need more sunlight too! Thank you in advance. Last week was my BIL E-day. So I was assigned by my MIL to do the 'Dulang Hantaran' and it decorations including all the goodies inside the dulang.. since this is only the engagement event, not so much personal items to be included in the dulang except for the rings.. both for merisik and engagement.. Since last time during my Nikah day, I did the DIY dulang hantaran using the artificial flowers and this time around I was thinking to do it with the fresh flowers. I purposely wanted it that way just because I can save a lot of time (since I am way too busy with my PhD study and I have to travel to and fro KL-JB) and at the same time we can avoid the hustle of keeping the dulang covered with dust in the store room. Lol..talking about experience huh! And most importantly.. we can save a lot of money.. Lemme show you the trick.. Saving the best for the last-Me! B's nature of work leaves me with no choice but to be independent. His work schedule knows no weekends and public holiday. But a kaki jalan I am by nature and nurture,what if it's only me and Aulia'? bring it on! Nak keluar jugak! I thought it was impossible at first but naaa, practice makes perfect, I am so used to it already, you'll be surprised of what I can do with only one hand. Haha The skills develop naturally. From folding stroller and do groceries shopping while pushing the cart and her stroller? I have done all that. But there are time I do need hands from strangers, and kudos to Malaysians, they're helpful. And I think this is the perfect bonding time because Aulia' is with her baby sitter during the weekdays. Anak dara aku dah lama mintak dok nak pakai subang..alahaii..girly stuff gitu. Dia tengok aku pakai makeup dia pun nak makeup. Tengok pakai lipstick dia pun nak jugak. . . Bulan lepas ni dia tengok ada sorang girl dalam lingkungan umur 4-5 tahun kat mall pakai subang..Dia kata cantik..dia pun nak..
Memang selalu dia buat ayat macam tu kalau nak apa-apa..
"Ibu..cantiknye yang kat telinga dia tu ibu..tengok tu..apa tu? Aulia' rasa Aulia' pun nak la jugak"
"Tu subang. Nak pakai subang, kene tindik telinga dulu. Klau nak tindik, kene tembak dulu telinga sampai berdarah baru boleh pakai subang.."
Aku saja bagi cerita horror sikit kat dia so conversation tu boleh stop kat situ..
Dia pun tenung je aku bila aku sebut "berdarah-darah" tu...agaknya tak berani nak continue cerita lagi. Hahaha.Berjaya!